One of the Solid Waste Authority's employees informs students about the company's different facilities and how they help the environment. When we throw all of our trash away here in South Florida, where does it go? The sixth grade found out on Friday, January 25 and Monday, January 28. 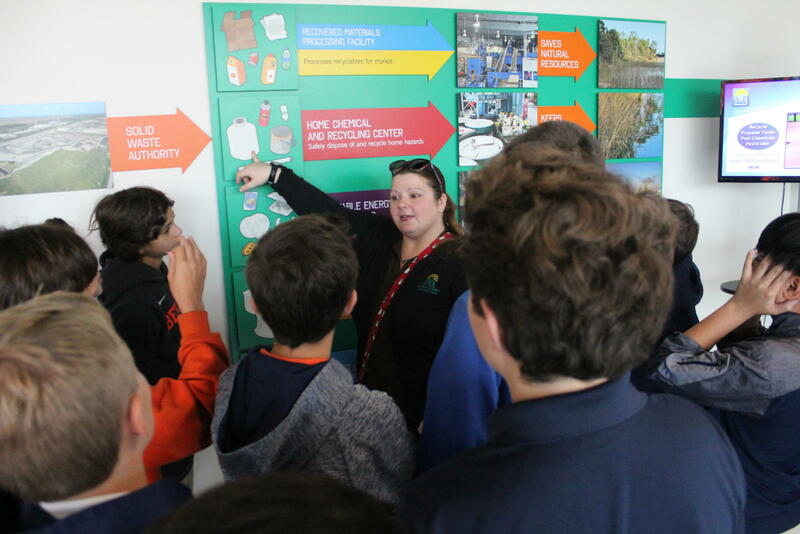 It was the annual sixth-grade Palm Beach County SWA (Solid Waste Authority) trip. To make the trip more meaningful for the students and make it a bit easier on the SWA educational staff, the sixth-grade girls went on Friday, and the sixth-grade boys went on Monday. Students traveled to the facility and learned that all of their trash actually goes somewhere and does not just “disappear.” Students also learned how the trash is separated and organized into different groups such as plastic, paper, aluminum, etc. Sixth grader Cameron Feiner plays an interactive trivia game. The sixth grade has been learning about recycling and the environment over the course of the last couple of months. They are also learning about the human race’s impact on the planet, which lead them into their unit about water and air pollution. The trip to the SWA was a supplement to that curriculum. 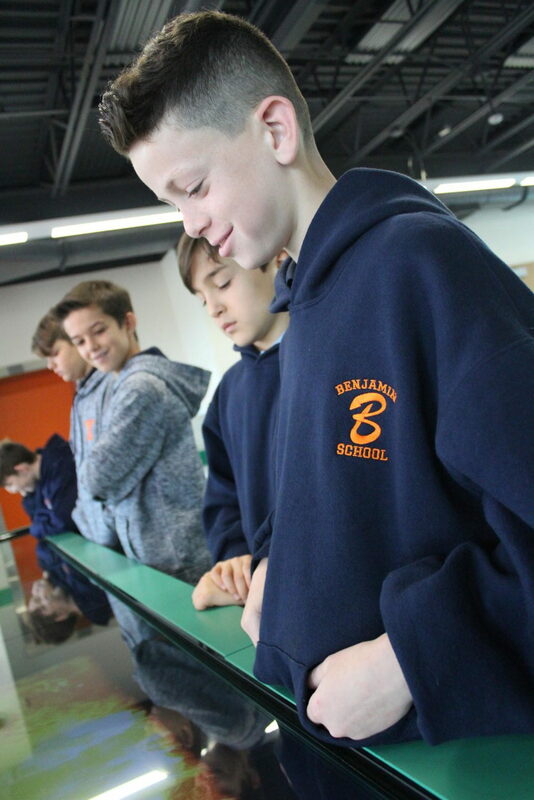 The students visited several different parts of the facility, including the educational center, the rooftop garden, and the indoor dump site which is as long as a football field and where several remote-controlled claws move the trash into the incinerator. The SWA in Palm Beach County is high tech because instead of letting the trash pile up, the site burns it and uses the steam to turn a turbine which creates massive amounts of energy. This energy is then sold to Florida Power and Light and used to provide electricity to thousands of homes across Palm Beach County. the landfill is always expanding and the incinerator does not pollute the air because it uses technology. The students were taught about how the garbage there is sorted and how it affects the environment by destroying trees and producing carbon dioxide and the living things in it. The plant’s renewable energy facility 2 (REF 2), which opened in 2015, reduces the amount of waste going to SWA’s landfill by up to 98 percent, ensuring that SWA’s landfill will last until about 2045. The facility also generates 100 megawatts of electricity for the people in Palm Beach County. According to the SWA website, that’s enough electricity to power an estimated 44,000 homes and businesses, or about all the homes in Boca Raton. 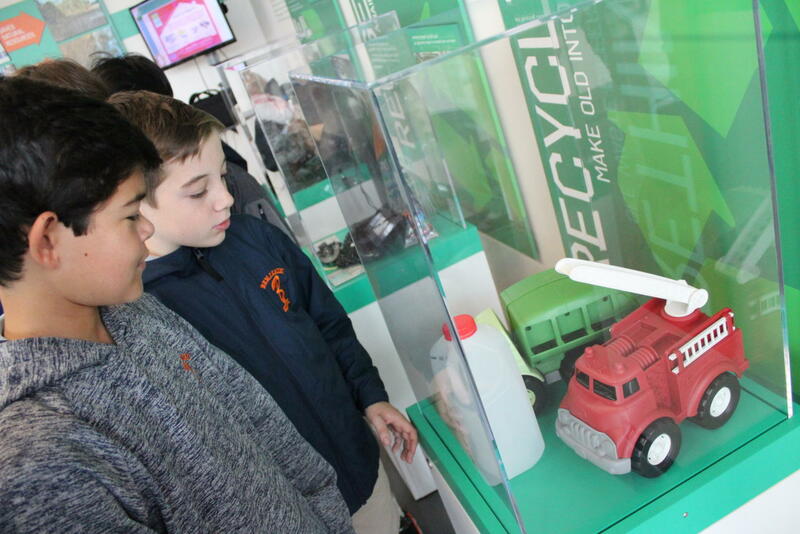 Sixth graders Cooper Sukhu and RJ Sahm learn about the process of recycling via a display in the SWA’s education center. Both the REF 1 (opened in 1989) and REF 2 facilities turn garbage into electricity by boiling it. The refuse is sorted into burnable and unburnable waste. The burnable waste is fed into large boilers which produce steam. That steam, in turn, drives a turbine generator to make electricity. The chemicals released by the boiling are cleaned using benign chemicals, carbon spray, and a lime slurry so those fumes and harmful particles are not released into the air. Any ash or non-burnable material left over is placed in the nearby landfill. Overall, the sixth grade learned a valuable lesson about recycling, the enormous amount of trash produced in our county each day, and why the SWA is such an important facility. It was an experience that underscored what Benjamin does very well – providing the students with first-hand knowledge that will make them more educated and conscientious citizens.